Jenn (Chief Medical Oddity) is a sometime government affairs professional who is currently learning how to take time to focus on her health. With her yorkie Gracie by her side, she is finding new ways to fill her days and reinvent herself. 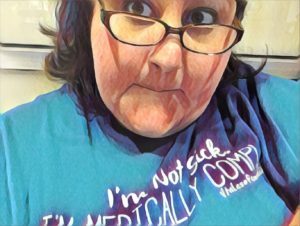 Jenn tried to find the humor in everything she does, especially in the inanities of being chronically ill. In a seemingly different lifetime, Jenn enjoyed preforming improv, all things political and training for charity half marathons. These days she savors spending time with family, interacting with her spoonie community, cuddling with the dog and, on a good health day, crafting. And she continues to write.